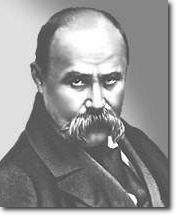 Taras Hryhorovych Shevchenko was the foremost Ukrainian poet of the 19th century and a major figure of the Ukrainian national revival. 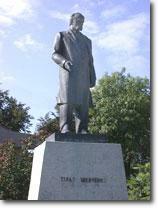 As in so many towns and cities of Ukraine, his statue dominates a small park in Tovste, on Ukrainska Str., near the Greek Catholic church. Born into serfdom in Morintsy, Ukraine, Shevchenko was freed in 1838 while a student at the St. Petersburg Academy of Art. His collection of poetry, beginning in the early 1840s, ranged from nostalgic reflections on Cossack life to a more sombre portrayal of Ukrainian history. Shevchenko was punished by exile and compulsory military service for writing a number of poems that satirized the oppression of Ukraine by Russia and prophesied a revolution. He had a revival of creativity after his release in 1857; and his later poetry treated historical and moral issues, both Ukrainian and universal.